232 pages | 8 B/W Illus. Cognitive development in children is a highly complex process which, while remarkably resilient, can be disrupted in a variety of ways. This volume focuses on two types of neurodevelopmental disorder: syndromic conditions such as fragile X syndrome, Down syndrome, Williams syndrome and velocardiofacial syndrome; and non-syndromic conditions including dyslexia, specific language impairment, autism spectrum disorder and attention deficit hyperactivity disorder. 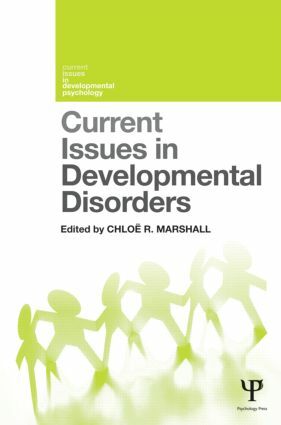 The book also looks at how the study of developmental disorders has contributed to our understanding of typical development, and themes emerge that are common across chapters, including intervention and education, and the neurobiological bases of developmental disorders. The result is a fascinating and thought-provoking volume that will be indispensable to advanced students, researchers and practitioners in the fields of developmental psychology, neuropsychology, speech and language therapy, and developmental disorders. C. Marshall, Glossary and Introduction. Part 1. Current issues in the study of developmental disorders: 1. D. Williams, S. Lind Comorbidity and diagnosis of developmental disorders. 2. D. Newbury, The genetics of developmental disorders.3. B. Byrne, R. Olson, S. Samuelsson, The longitudinal perspective on developmental disorders. 4. M. Thomas, F. Baughman, T. Karaminis, C. Addyman, Modelling developmental disorders. 5. P. Roy, S. Chiat, Teasing apart disadvantage from disorder: The case of poor language. 6. S. Wong, M. Xiao, K. Chung, Issues of culture and language in developmental disorders: The case of dyslexia in Chinese learners. Part 2. Reflections on the study of developmental disorders. 7. P. Hellal, M. Lorch, Why study the history of research into developmental disorders? 8. R. Filippi, A. Karmiloff-Smith, What can neurodevelopmental disorders teach us about typical development? Chloe R. Marshall, PhD, is Senior Lecturer in Psychology and Human Development at the Institute of Education, University of London, and a former Montessori nursery teacher and teacher-trainer. Her research investigates typical and atypical language acquisition in hearing and deaf children, with a focus on specific language impairment and dyslexia.